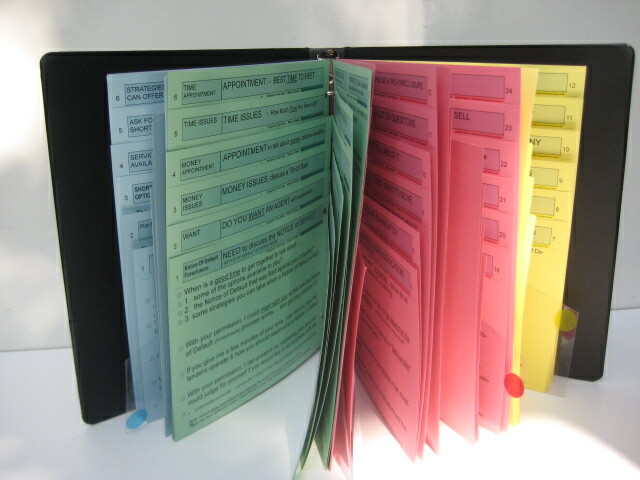 Commercial real estate Leasing Sales assistants scripts. 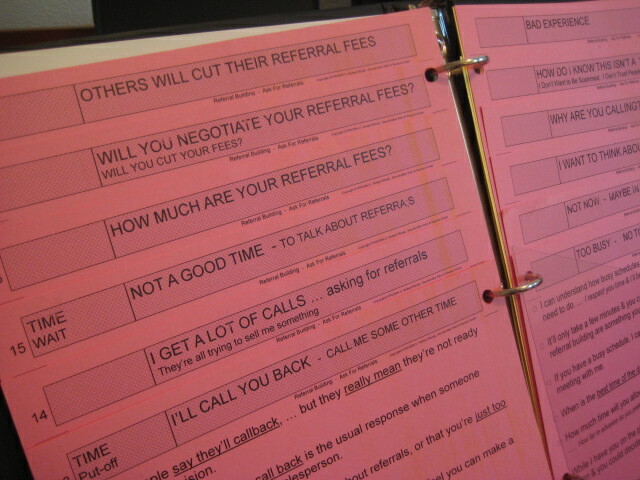 Telemarketing lease scripts for commercial real estate (and) lease scripts for sales assistants. Telemarketers scripts for commercial real estate leases are produced for the purpose of calling a owner of an investment property. Scripts for the lease investment property are used for the purpose of hiring a sales-assistant or telemarketer to call on property owners of investment property. Commercial real estate agents have limited time for prospecting for new business have found it lucrative to hire a telemarketer to make lease prospecting calls. 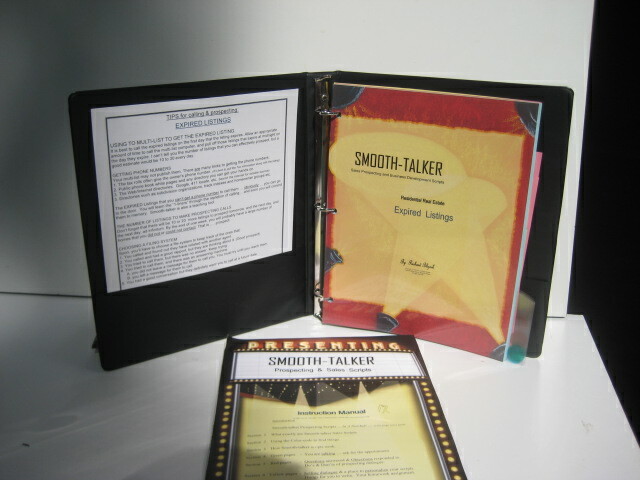 Smooth-talker Sales & Prospecting Scripts is reponding to your request for much-needed lease scripts for telemarketers. 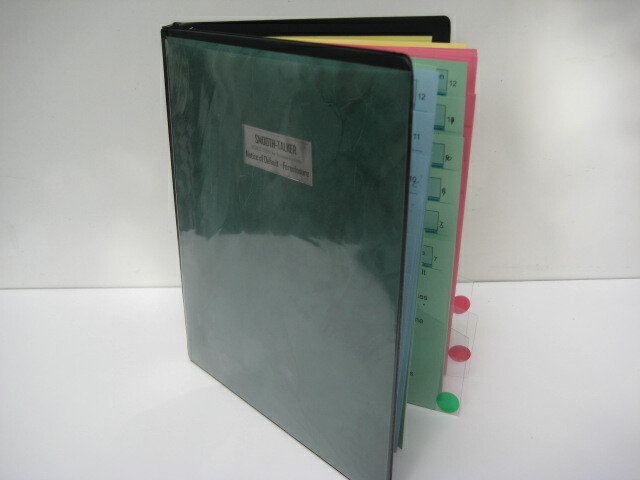 The script comes withe a high-quality leatherette 3-ring binder, a 24 page Instruction Manual and extra pages so you can write your own additional scripts. For a complete list of page headings for Commercial Real Estate Telemarketers Lease scripts, go to the bottem of this webpage. Telemarketing scripts for commercial real estate leases and lease scripts for sales-assistants are designed to make calls to potential prospects using to proper words. You can't expect a sales-assistant or a telemarketer to have the same skill set that a full fleged real estate professional has. Commercial real estate telemarketing lease scripts can be used to increase the prospecting activity by multiplying the effectiveness of the agent. Sales-assistants and telemarketers have many different names. Sometimes they are referred to as sales-assistants or apointment-setters sales. Commercial real estate lease sales assistants are referred to by many names including: inside sales assistants, marketing reps, business development aides, sales support associates, prospecting helpers, sales affiliates and many other unique monikers. But the reality is that all real estate professionals want to leverage their efforts to make more calls to prospective clients using the telephone. Commercial real estate telemarketers can produce many leads. Lease scripts for telemarketers can produce a large number of leads if they are prepared with a script. Commercial real estate telemarketing scripts will lead to increased revenues due to the fact that they help generate new business leads. No such scripts exist to help sales-assistants, appointment-setters, and telemarketers prospecting for commercial real estate leasing. The value of a telemarketer and sales-assistant. A commercial real estate leasing telemarketers depends on scripts for their skills to make prospecting calls to a wide range of people with disposable income. Realtors depend on revenue generated from calling prospects to list and sell more homes. The value of a commercial real estate lease sales-assistants script cannot be overstated. They need a real estate sales script to know what to say to a prospect and how to respond to an objection. I'm not interested. I don't want your products or services. Send me some information. Not now, .. I want to wait. Now it not a good time. Will you cut your commission? I'm too busy. Call me some other time" ... and on ... and on. Calling for commercial real estate leasing is a skill that can be acquired by telemarketers. Some commercial real estate sales assistant cannot master the skills required for a telephone prospecting, forcing them to rely on other less effective methods of getting new business. It forces the company to spend enormous amounts of money on advertising, direct mail, and passive marketing methods in hopes of reaching the same person by making a prospecting cold-call for free. Building a good relationship and establishing trust is essential. Leasing scripts for commercial real estate is to build their business in a geographical area must establish an image of trust and ethical dealings. There is very little that is more intimidating then making telephone cold-call when calling on potential customers that they don't know. Everyone hates rejection, even sales-assistants & telemarketers. Commercial real estate telemarketers often take rejection personally. Perception is reality in their mind. The real problem is not that other people are unfriendly, it’s the inability to handle other people so they are not a problem in the mind of a salesperson. Commercial real estate salespeople tend to get involved in the conversation at hand and are reacting on the prospects terms. Often it's better to just offer your services & let the conversation flow .. for example: "I'm simply calling to let you know about the services that I offer." *** Note: regarding un-licensed sales assistants & telemarketers. The scripts take great care to assure that they only determine if there is an interest in the services of the employing agent & broker and no specific property is discussed. 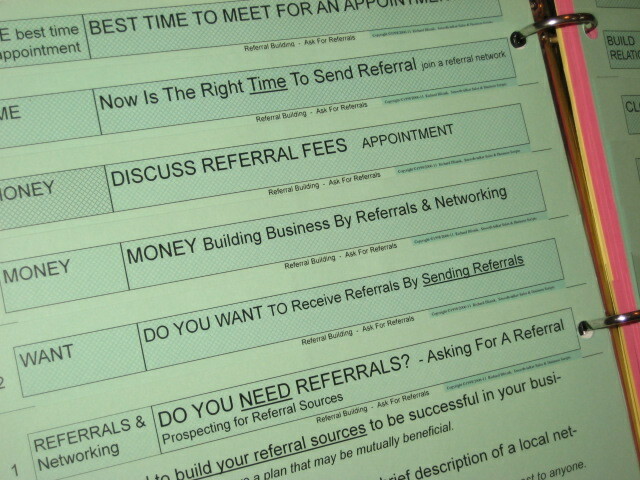 Headings for Commercial Real Estate Telemarketing Lease scripts are pictured below. GREEN 24 pages in total. You are doing the talking. The dialogue identifies you, gives a reason for the call, and states a brief selling message. Do you want to lease or property. Prospecting call for leasing. Reasons to lease. Old Lease listing - renew interest. Follow-up call, previous contact. Follow-up call after after a mailing. Let you know they service available. You can lease my propertywith a one-party listing." Old prospect - Call to renew interest. Expired Lease listing - renew interest. For Lease By Owner cold call. Will they sign a"one party" showing / listing. Not listed - but it's still for sale. Calling before or after business hours. Need the services of an agent. Decision - To List & Choose an agent. Do You Want The Services Of an Agent . Potential to do business - Motivation. Best Time To Meet For an appointment. Overcome Reluctance Take the next step. Time - When Will Prospect List. Closes - Ask for the order. Money - appointment to talk about finances. Get An Agreement To List With Me. Get More Money For Selling. Build Relationships Take the next step. RED pages contain Questions that must be answered and Objections that must be responded to. I’m Not Interested. Why are you calling? I Don’t have any plans to sell. Why Should I Choose You? Too Busy - No Time to see you. Why Should I Change Agents? I’ll Think about It - Stalling. Do You Have a Buyer? Send Information - Tell me by phone. Bad Experience - I’m Mad At You Agents. Sell It Myself, Save The Commission. I’ll List with a neighbor. If you’re so good then get me my price. Friend in the Business. How Much Is Your Commission? I'll list with a Neighbor. Others charge less commission. Wait until the Economy Gets Better. Will You Negotiate Your Commission? I Want to Wait - Now Is Not a Good Time. Others charge 1% commission, $500 fee! ?? Call Me Some Other Time. YELLOW pages are the traditional selling language and the reasons to do business with you. There are "fill-in-the-blanks" for you to put facts about you & your product or services. 30 Second Commercial. Reasons to Choose Me. Agent Profile - Agent Services. Reasons to Choose My Company. Agent Services - What I Can Do. Resources, Internet, Research, Size, History. Affiliations - Guarantees - References. What a Broker and Agent Can Do. Benefits of Company & Agent Services. Marketing Plan I Intend to Use to get your investment property sold. Commercial real estate sales assistants lease agents need constant contact. To successfully list the property owner, constant contact must occur with them. You must have establish a good relationship with them in order that they trust you enough to list their commercial property. That's time that the busy agent just doesn't have. Telemarketing scripts for leasing are for calling on owners who are trying to lease their commercial property without a real estate agent. Remember! it takes 5 contacts to make a sale. A sales-assistant or telemarketer can make those calls. 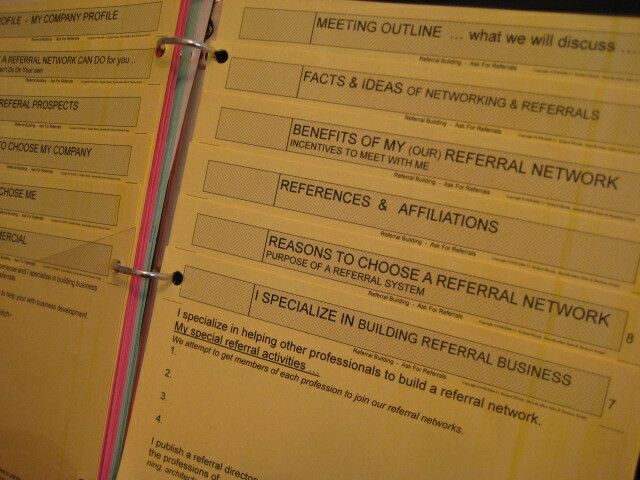 An old saying in the business world says; "It takes 5 contacts to make a sale." Its an old saying that's practically chiseled into stone. It has been proven in all business's & professions. With most commercial real estate lease telemarketing, making just one contact is hard enough! Do you have the time to make those five contacts?